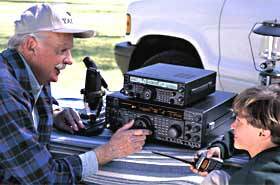 The Yaesu brand is well known among ham radio aficionados and is synonymous with premium quality ham radios. From stationary multi-feature communications equipment to portable devices, YAESU has consistently represented the best in communications equipment to the world's top DX'ers for over half a century. available on Select Yaesu products! February 1st, 2019 thru April 30th, 2019. Click HERE to download the Amateur Equipment catalog. Click HERE to download the Full line HF catalog. Click HERE to download the Full line VHF/UHF catalog. Click HERE to register your Yaesu Product Online. Yaesu USA in Cypress, CA is currently looking for an Amateur Technician for repair units. If you have experience and ability with Radio Amateur VHF and UHF mobile transceiver repair, and currently hold an FCC Amateur Radio Operator license. If this position interests you, please send your resume to: amateurtech@yaesu.com Attn: Mikio Maruya. The FT-4VR 2 meter HT has three output power levels: 5, 2.5 or 0.5 watts transmitting from 144 to 148 MHz. Receive coverage is 65-108 (FM broadcast band) and 136-174 MHz. The FT-4VR is compact and light, yet ruggedly constructed. The speaker provides a full 1 Watt of powerful, clear audio. The supplied 1750mAh Li-ion battery pack is capable of up to 15 hours operation (TX 5 seconds, RX 5 seconds, Standby 90 seconds). The SBH-22 3.5-hour rapid charger is included. VOX operation is available with the optional SSM-512B earpiece microphone. Other features include: WX Channels with “Severe Weather” Alert, PC Programming (optional cable), Transceiver-to-Transceiver Cloning (optional cable), Keypad Entry, FM Broadcast Receiver, Automatic Range Transponder System (ARTS), CTCSS/DCS Operation, Busy Channel Lockout (BLCO), Automatic Power Off feature and Transmitter Time Out Timer (TOT). Size: 2.1 x 3.5 x 1.2 inches (less knobs and antenna) 8.82 oz. The FT-4XR 2 meter/ 440 MHz HT has three output power levels: 5, 2.5 or 0.5 watts transmitting from 144 to 148 MHz and from 400 to 480 MHz. Receive coverage is 65-108 (FM broadcast band), 136-174 and 400-480 MHz. The FT-4XR is compact and light, yet ruggedly constructed. The speaker provides a full 1 Watt of powerful, clear audio. The supplied 1750mAh Li-ion battery pack is capable of up to 15 hours operation (TX 5 seconds, RX 5 seconds, Standby 90 seconds). The SBH-22 3.5-hour rapid charger is included. VOX operation is available with the optional SSM-512B earpiece microphone. Other features include: WX Channels with “Severe Weather” Alert, PC Programming (optional cable), Transceiver-to-Transceiver Cloning (optional cable), Keypad Entry, FM Broadcast Receiver, Automatic Range Transponder System (ARTS), CTCSS/DCS Operation, Busy Channel Lockout (BLCO), Automatic Power Off feature and Transmitter Time Out Timer (TOT). Size: 2.1 x 3.5 x 1.2 inches (less knobs and antenna) 8.82 oz. YAESU is proud to announce that AOR, a leading radio manufacturer in the professional / government sector, and YAESU has been working together to develop a new SDR handheld receiver, AR-DV10, and AOR has decided to distribute the new SDR handheld receiver in the North America through YAESU distribution channels. We, YAESU are excited to deliver this advanced SDR receiver to the ham-radio enthusiasts in the North America. We will release the new product announcement for the North America next week. AOR distributes this product to the rest of the world through their distribution channels. The new FT-70DR is a compact and very attractively priced YAESU System Fusion transceiver providing both conventional analog FM operation and the advanced C4FM Digital mode. The FT-70DR provides up to 5W of reliable RF power, and its large Front Speaker delivers 700mW of Loud Audio Output. Because C4FM has better BER (Bit Error Rate) characteristics than other digital modulations, the user can expect exceptional audio quality. The new digital FT-70DR includes our unique Automatic Mode Select (AMS) function. AMS detects the operating mode of the received signal as C4FM digital or analog FM, and then automatically and instantly switches the receiver to the appropriate mode. Users do not need to manually change between modes. The multi-colored LED Mode-Indicator displayed on the front allows the operator to easily see what mode the FT-70DR is in at any given moment. LED Mode-Indicator clearly and visibly shows the transmit/ receive mode by changing its color so that the operating mode of the transceiver is easily recognized at a glance. One of the other distinguishing features of the FT-70DR is Digital Group Monitor (GM) with DG-ID and DP-ID. DGID (Digital Group Identification) and DP-ID (Digital Personal Identification) are useful features now included in the FT-70DR, to simplify the GM operation. Simply put, the transceivers selecting the same DG-ID or DP-ID can communicate with each other. Between 00 and 99 DG-ID and DP-ID are selectable which provides loads of flexibility so that users can enjoy group communication with friends in GM mode in accordance to their individual operational needs. The FT-25R is a very compact, ruggedly constructed Handheld VHF with three selectable power settings 5W / 2.5W / 0.5W allowing each user to select the power they need. The big front speaker provides a full 1 watt of crisp, clear audio quality. The unit comes supplied with a 1950mAh Li-ion battery pack capable of over 9 hours of operation, with an optional higher capacity 2500mAh Li-ion battery for over 11.5 hours of operating time. A 3.5 hour rapid charger comes standard, making the transceiver ready to operate at any time. Our newly designed large white LED displays are vibrant and highly visible. Four Quick Recall Keys (QRK) are user programmable to instantly recall favorite channels with just the push of a button. VOX operation is available with the optional Earpiece Microphone SSM-512B. Other useful features included: versatile scanning capabilities such as Programmable VFO Scan, Memory Scan, Priority Channel Scan, and Weather Alert Scan, WX Channels with "Severe Weather" Alert, PC Programming, Transceiver-to-Transceiver Cloning, FM Broadcast Receiver, Automatic Range Transponder System (ARTS), CTCSS/ DCS Operation, Busy Channel Lockout (BLCO), Automatic Power Off feature, and Transmitter Time Out Timer (TOT). The FT-65R is a very compact, ruggedly constructed Handheld VHF/UHF with three selectable power settings 5W / 2.5W / 0.5W allowing each user to select the power they need. The big front speaker provides a full 1 watt of crisp, clear audio quality. The unit comes supplied with a 1950mAh Li-ion battery pack capable of over 9 hours of operation, with an optional higher capacity 2500mAh Li-ion battery for over 11.5 hours of operating time. A 3.5 hour rapid charger comes standard, making the transceiver ready to operate at any time. Our newly designed large white LED displays are vibrant and highly visible. Four Quick Recall Keys (QRK) are user programmable to instantly recall favorite channels with just the push of a button. VOX operation is available with the optional Earpiece Microphone SSM-512B. Other useful features included: versatile scanning capabilities such as Programmable VFO Scan, Memory Scan, Priority Channel Scan, and Weather Alert Scan, WX Channels with "Severe Weather" Alert, PC Programming, Transceiver-to-Transceiver Cloning, FM Broadcast Receiver, Automatic Range Transponder System (ARTS), CTCSS/ DCS Operation, Busy Channel Lockout (BLCO), Automatic Power Off feature, and Transmitter Time Out Timer (TOT). The FTM-3200DR is the latest addition to the YAESU System Fusion family! Once again YAESU continues the legacy of providing high-performance ruggedized radios packed with exceptional features at an affordable price. Browse our entire line of HF Transceivers/Amplifiers and Digital Products! Visit your nearest Yaesu dealer to see the latest in-store promotions and rebates.